Will China’s 2016 Gold Strategy Collapse Anglo-American Capitalism? The world community of nations can no longer withstand the utter ruin that the Anglo-American Axis (AAA) has wrought upon the planet in the interest of maintaining its longstanding hegemony. Both Russia and China have been on a very serious mission to decouple the BRICS economic structure and financial markets from the petrodollar. They know that as long as the once Almighty Dollar is utilized as the world reserve currency, there will never be peace … ANYWHERE. Hence, the BRICS-aligned nations have been very busy creating a new financial system (most of the important developments are occurring under the radar) that will render the post-WWII Bretton Woods Agreement virtually obsolete. This is the primary reason for the unfolding WWIII scenario throughout the Middle East. The financial engineers and economic hitmen of the Anglo-American Empire have sufficiently infiltrated every nation on Earth so as to wreak havoc at will. This stealthy institutional interpenetration by the AAA took place insidiously over centuries so that covert blackops could be forever conducted in a clandestine manner. Even Russia and China are not immune to such financial terrorism and economic sabotage as only the AAA can perpetrate. 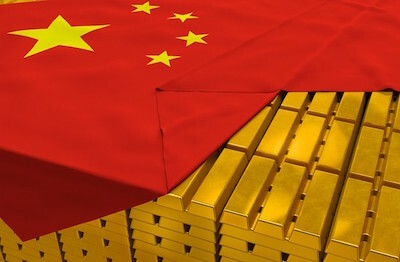 However, both China and Russia have been systematically executing their own “Gold Strategy”. The following article posted in its entirety below well explains the basics of this initiative to terminate gold price manipulation implemented daily by New York City’s COMEX and The London Bullion Market Association in the City of London. Their patently illegal suppression of the global gold price has been carried out through a massive EFT trading system in paper gold instruments. That paper gold will be left worthless, with no deliveries to back it up, once China moves forward in earnest with their new gold exchange. Why is GOLD so very important? There are multiple reasons but the most important is that it represents a safe haven during times of great economic turmoil and financial chaos. In this way it functions as the great barometer of the real financial condition of the world as well as the true state of the economy. Whenever investors flock to gold, they know the markets are ready for an anticipated crash, a periodic correction or a serious collapse. In some ancient cultures Gold was believed to be the congealed blood of the gods (it appears in veins) who came down to Earth to defend humanity from their oppressors (aka the antigods). The bottom line is that, given the extraordinary instability of the markets and unrelenting economic insecurity worldwide,Gold is soon to be King; Silver is Queen, and Platinum and Palladium are Prince and Princess. This ongoing development within China and the other BRICS is as BIG as it gets. 2016 is destined to be the year that the Global Economic and Financial System will undergo massive unparalleled change, once and for all. Gold has always been the foundation for national economies for good reason, as it also functions as a store of wealth for householders, especially in China, India and Russia. There’s a very good reason why this past Chinese New Year celebrated the Year of the Fire Monkey. This particular year always brings about radical changes as it did when it occurred in 1776. The Fire Monkey ensures that the whole place will experience the most profound and fundamental transformation of a lifetime. 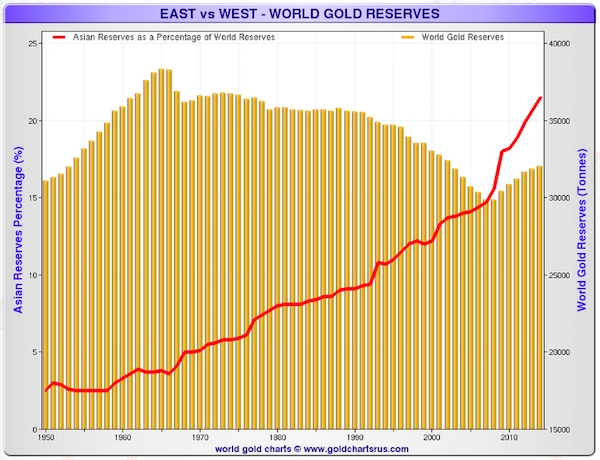 Simply put, when the reset button is hit in 2016, the methodical wealth accumulation of gold performed throughout the East over many years will prove to be the greatest gamechanger of all time. The global geopolitical chessboard is in the continual state of rearrangement; however, only the astute observer will correctly perceive that the true locus of worldly power always shifts from the East to the West, and then to the East again … with the movement of the golden Sun. If you believe that the gold price has been suppressed in order to maintain faith in fiat money and allow governments to continue deficit spending to secure their power, it is logical to conclude that gold prices may rise sharply as the disconnect between paper and physical pricing intensifies. And it would make sense for China, Russia and other BRICS nations to push for such a transition, as it would diminish the dominance of the United States in global trade and finance, leveling the playing field.